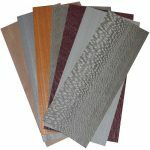 Our dyed veneer in more than 20 different colors will suit your projects splendidly. If you are looking for a product that will make your project stand out, look no further than the dyed veneer we offer here at Sauers & Company Veneers. This product is ideal if you are looking for color consistency as we make sure each color is pressure cooked throughout each leaf during manufacturing. You’ll enjoy the natural beauty of the wood grain while also enjoying a pop of color that can give your finished project the unique look you are hoping for. You won’t lack for options with our dyed veneer as we have more than 20 different color choices and a variety of sizes and combinations. You can also take advantage of our cost-effective assortment packs of dyed veneer that are shipped right to your New York City address. Whether you are looking for something vibrant, such as an orange, red, yellow or white dyed veneer or an earth-tone such as grey, green, or blue, you can rest assured you will love the results. We have been in business for over 50 years and are popular with some of the largest domestic furniture manufacturers because of our cutting accuracy, consistently high-quality products, and top-notch customer service. In addition to dyed veneer we offer plenty of other options with more than 125 species represented. If we don’t have what you are looking for in stock, we will find it to make it available for you. Feel free to contact us if you have any questions about dyed veneer or any of our wood veneer products and accessories. At Sauers & Company Veneers, we create dyed veneers for residents of Anaheim, Los Angeles, and San Francisco, California; Dallas, Texas; New York City; Chicago, Illinois; Boston, Massachusetts; Charlotte, North Carolina; and anywhere else in the United States.